For anyone calling himself a Christian this is a MUST read. It truly is a matter of life or death. The talmud is what Jesus Christ called at the time (before it was written down), "The traditions of the elders." It was NOT a compliment. Left, Esther denounces Haman. Threat of genocide is excuse for actual genocide. determination to exterminate all those who stand in the way of Israel and the New World Order. This includes Palestinians, Iranians and Christians. 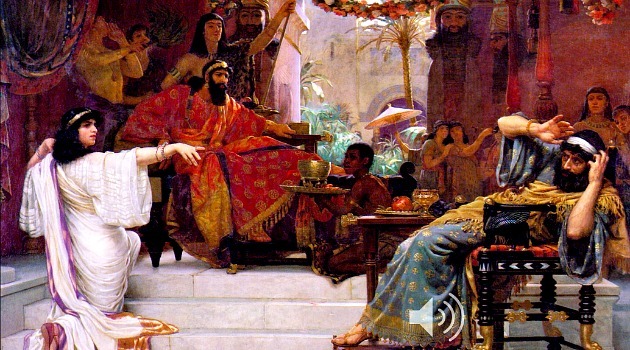 The Persian empire of the 4th century BCE was ruled by King Ahasuerus and his Queen Esther, a crypto Jew. The story which may be apocryphal, relates that Queen Esther hears of a plot by the Prime Minister "Haman" to exterminate the Jews. She goes to her husband the king and turns the tables. Haman is hanged and the Jews preemptively kill all those thought to pose a threat. Five hundred attackers and Haman's ten sons are killed in Shushan. Throughout the empire 75,000 Jewish enemies are killed (Esther 9:16). On Purim, Jews actually consume cookies called Hamentashen in the shape of Haman's ear to celebrate this joyous occasion. Latest! Michael Hoffman - Purim in Brussels "The hidden hand that keeps the Israeli state immune from Wahhabist Islamic terror has inflicted Purim-style vengeance on a dying Europe through that very terror." Purim 2012: Kill the "Anti-Semites"
On Purim 1994 Brooklyn-born Israeli settler Baruch Goldstein slaughtered 40 Palestinians while they prayed in Hebron. 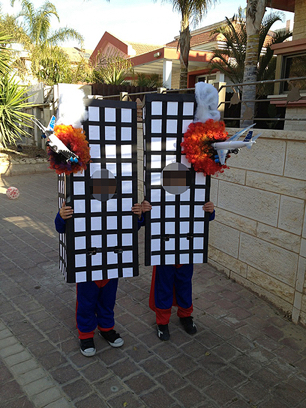 On Purim 2003, the U.S. invaded the sovereign nation of Iraq, officially to eliminate illicit weapons of mass destruction but in reality to neutralize a possible Iraqi threat to the Israeli government. Nearly 5,000 dead Americans and a trillion dollars later and Iraq has been totally neutered, just as the Israelis and their American agents had hoped, notwithstanding the damage to the US economy and our service men and women. 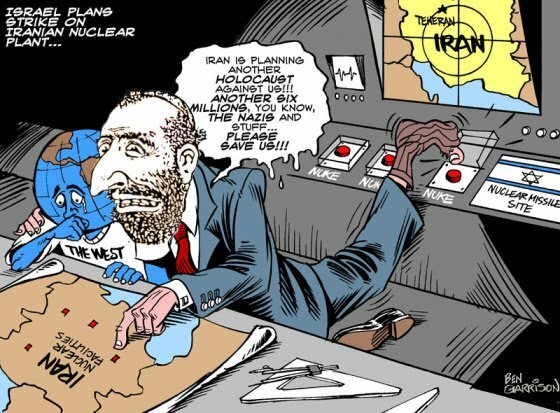 In the run-up to Purim 2012, Senator John McCain called for a deficit-ridden America to undertake a multi-million dollar bombing of Syria, while Senator Joseph Lieberman, speaking at the Israeli lobby's AIPAC conference, demanded a U.S. attack on Iran if the government of that Persian nation will not stop its non-existent 'nuclear weapons program.' The German philosopher G.W.F. Hegel observed that the only thing we learn from history is that we learn nothing from history. J.D. Longstreet on the website of the "Save America Foundation: Patriots in Action" states: "Before Iran was renamed Iran it was Persia. The rift between the Jews and the Persians is not new. It goes back many centuries...It is impossible to read the book of Esther this week, especially, and not see the parallels between an ancient Jew approaching a great potentate asking for help to save the lives of the Jewish people. One can only hope Obama reacts as did King Ahasuerus and that Obama and Netanyahu can both enjoy a few of those famous "Haman's Ear" cookies in celebration of the special occasion when the Jews were saved and Haman, the evil prime minister of Persia, did not succeed in his plot to kill all the Jews..."
On Sunday March 4, Herb Keinon wrote in the Jerusalem Post: "Netanyahu...will meet with US President Barack Obama on Monday to discuss how to stop a Persian tyrant interested in killing Jews. The meeting is just two days before Purim, a holiday retelling a similar tale, involving a Persian tyrant intent on killing Jews thousands of years earlier. Do not be surprised if Netanyahu somehow connects those two dots during public comments he will make in Washington." Why are we not surprised that, according to Israel National News, during the three hours that President Barack Obama spent with Israeli Prime Minister Binyamin Netanyahu in the White House on March 5, "Netanyahu took the opportunity to draw a parallel between the narrative in the Book of Esther - wherein the wicked Haman seeks to destroy the Jewish people throughout the Persian Empire - with Israel's modern day conflict with Iran...Iran is geographically Persia and the Iranians are descendants of the ancient Persians." A race war thousands of years old is invoked in deliberations of the President of the United States concerning our nation's war policy. The modern nation of Iran is identified with the ancient nation of Persia by the Israeli Prime Minister and his supporters in the Zionist press and American "patriot" right wing. The high Persian official Haman is likened unto the officials of present day Iran. This would be little more than Grade B schlock movie fare were it not invested with international gravitas before our very eyes. The ancient racial stereotyping against which the rabbis and the media howl when applied to "the Jews," is freely applied to the Iranians in the name of Israeli national survival and self-defense. This contemporary racial targeting becomes more ominous when we consider that Haman was identified as part of the nation of Amalek which God ordered annihilated. In Christian teaching, the nation of Amalek is no longer mentioned. This belief is in accordance with the Bible at Deuteronomy 25:17-19 "to blot out the memory of Amalek from under Heaven." Since Amalek is gone from the face of the earth and Bible-believers are to blot out his memory, those who keep the memory alive are in violation of God's prophetic will. This defiance emanates from the Babylonian Talmud, which envisions an on-going war with Amalekites who are defined by 21st century rabbis as the 'anti-semites' among us, meaning anyone who thwarts Zionism or Judaism. In addition to the grave threat of extermination that this warped belief presents to the dehumanized people of Iran, it is also a warrant for the murder of all the opponents of Talmudic Judaism and the apartheid "State of Israel" who are classed as "anti-Semites," whether or not they are Iranian. "AMALEK WAS THE FIRST "ANTI SEMITE"
Rabbi Eliezer Melamed, left, is a leader of the violence-prone Israeli settler movement and the head of Yeshivat Har Bracha in the occupied West Bank of Palestine. 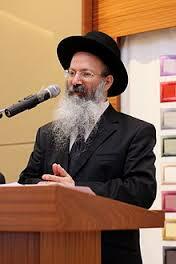 He is esteemed as an authority on rabbinic law. His major works include his legal treatise, Pininei Halacha. Melamed uses his weekly column in the Israeli newspaper Basheva to advocate attacks ("vengeance") on Palestinians by the Israeli government and the military: "We don't aspire to private vengeance, but to state vengeance led by the Israel Defense Forces and all the systems of government." (Cf. Haaretz, March 18, 2011). Rabbi Melamed has declared that those who worship Jesus Christ are idolaters: "...they (Christians) still embrace idolatry, believing that 'oto ha'ish' [Jesus] is god and the messiah, who will be resurrected to redeem the world... This delusion that Jesus is the mashiach (messiah) is indeed a false belief. As we learned from the words of the Rambam (Moses Maimonides, Laws of Kings 11:4): 'Jesus the Christian, who thought he was the Messiah... was the subject of a prophesy in the Book of Daniel (11:14): '...also the renegades of your people will exalt themselves to fulfill the vision - but they will stumble.' Could there be a greater stumbling block than this [Jesus]?" For Purim 2012, Rabbi Melamed has made the following declaration: "Although the main mitzvah of wiping-out Amalek rests upon the community in general, every individual Jew is also obligated to fulfill this mitzvah. Therefore, if one comes upon an Amalekite and has chance to kill him, but does not - he has annulled this mitzvah (Sefer HaChinuch, 604). Amalek was the first anti-Semite...Today, the seed of Amalek has been lost; however, if (it) becomes clear that a certain person is an Amalekite, following in their ways, it would be a mitzvah (blessed deed) to kill him (see Kol Mevaser 2:42)...Only after evil is eradicated from the world can there be complete joy. Thus on Purim, after the obliteration of Haman and his sons, happiness is especially great." Cf. Rabbi Eliezer Melamed, "Amalek: War Against the Root of Evil," Israel National News, Feb. 28, 2012 (emphasis supplied). Rabbi Melamed then creates an escape clause in case some people might be horrified at the notion of killing anyone labeled an "anti-Semite": "...if an Amalekite decides to take upon himself the fulfillment of the Seven Mitzvoth of Noah's Sons, according to Jewish law, there is no longer an obligation to kill him..."
The "Seven Mitzvoth of Noah's Sons, according to Jewish law" (i.e. Talmudic law and successive halachos derived from it), decree death for idolaters. In Judaism worship of Jesus Christ is defined as avodah zorah (idol worship). "Anti-semitic" Amalekites and those who worship Jesus are subject to death. They can only escape capital punishment by accepting the Seven Mitzvoth of Noah's Sons and denying that Jesus is God. This is what it means to "take upon" the "Seven Mitzvoth of Noah's Sons" (Noachide Laws): the messiah status and divinity of Jesus Christ must be denied. The U.S. Congress is on record (Public Law 102-14) recommending the enactment of these misnamed "Noah" laws (in Orthodox Judaism the patriarch Noah is derided as a low character; cf. Judaism's Strange Gods  p. 108). 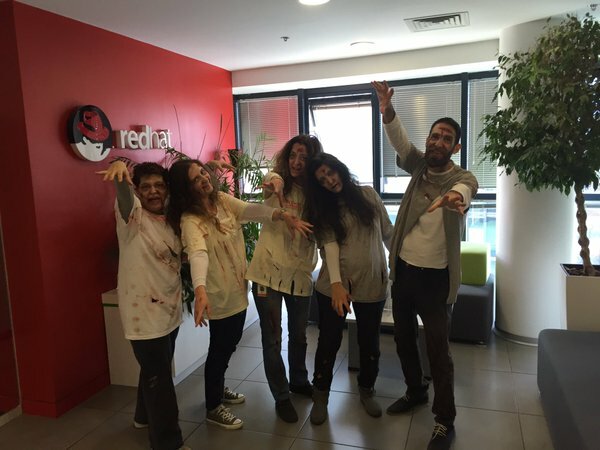 Employees at Red Hat Software in Raleigh celebrate Purim by dressing and behaving like zombies? Comments for " Judaism's Sinister "Purim" Fest "
Purim is a lie. The book of Ester is easily proven to be a lie as it has no references in the historical records. However, the book of Daniel who Jesus mentions in the New Testiment is a book of truth. In the book of Ester it says that Haman was the chief steward of Nebuchadnezzar but no reference in the historical record supports this. However, Daniel who was made the chief steward does have references in antiquity. At the council of Trent when the bible was being canonized, their were great debates as to whether or not the book of Ester should be added to the bible as we know it. Many texts were rejected because they lacked factual references which could be traced back. The reason why Ester was added was due to 5 hidden rubrics which clearly had the sacred name of GOD / YHVH included in the book of Ester. What is interesting is that in some of these instances the name of GOD / YHVH are written in reverse. This is a Satanic thing to write the name of GOD backwards. But I believe it is symbolic to those who would call themselves Jews and whose true lineage are Ashkenazim / Turkic and have no Semitic Blood / DNA. Jesus warned us about them in Rev 2:9, 3:9. Bottom line.. Ester like the Ashkenazim today masquerade as Jews and are so filled with hate because their Babylonian traditions clearly state they are gods and we are their chattel / slaves. I concluded that the reason for including the book of Esther in the Bible is to warn Christians to beware of Jews. In 2014 I wrote a commentary on Esther. My concluding remarks are at http://tcallenco.blogspot.com/2014/08/esther-part-5.html. The first four parts can be accessed from June and July 2014 on the right side of the page.